Phragmites (Phragmites australis), also known as the common reed, is an aggressive wetland invader that grows along the shorelines of water bodies or in water several feet deep. It is characterized by its towering height of up to 14 feet and its stiff wide leaves and hollow stem. Its feathery and drooping inflorescences (clusters of tiny flowers) are purplish when flowering and turn whitish, grayish, or brownish in fruit. Eventually, Phragmites become the sole dominant plant in many of these wetlands at the expense of native flora and animals dependent on these native habitats. Stout, warm-season perennial grass ranging in height from 6-13 ft. Forms dense, impenetrable stands, in contrast with the native subspecies which occurs in a colony of scattered stems. Spreads easily and extensively by seed; also by an extensive, aggressive system of horizontal and vertical rhizomes that can live for 3-6 years. Before taking any action, you should first determine whether the plants are native or invasive Phragmites. 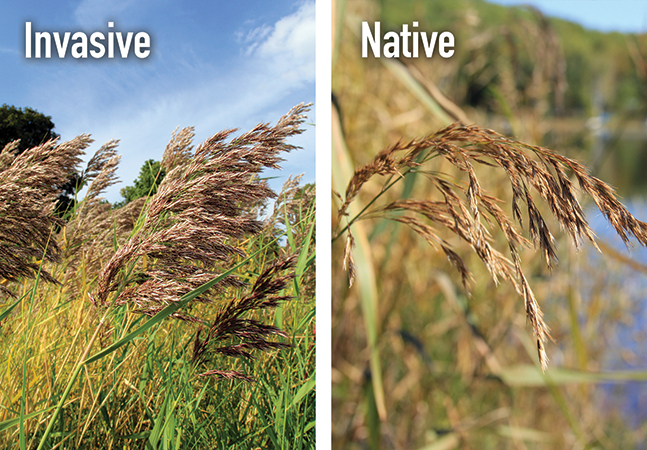 Use the following photos to help you identify the difference between native and introduced species of Phragmites. Flat, smooth leaf blades; 10 - 20 inches long, 0.4 - 1.4 inches wide. Leaf sheaths stay attached even after the stem dies. Flat, grey-green in color. They adhere tightly to the stem throughout the growing season and persist on the stem as long as it remains standing. Leaves are pale to yellow-green. The Sheaths fall off in the fall or flake off easily. Can reach 15 feet in height, are very rigid, and are slightly ridged with a rougher texture than the native stem. Reddish-purple in color at the base. Stems are smooth to the touch, appear somewhat shiny and often have a red to chestnut color towards the base, particularly where the leaf sheaths have opened up or fallen away from the stem. Flowers are dense branched clusters at the end of each stem, becoming open and feathery at maturity. Abundant seeds. 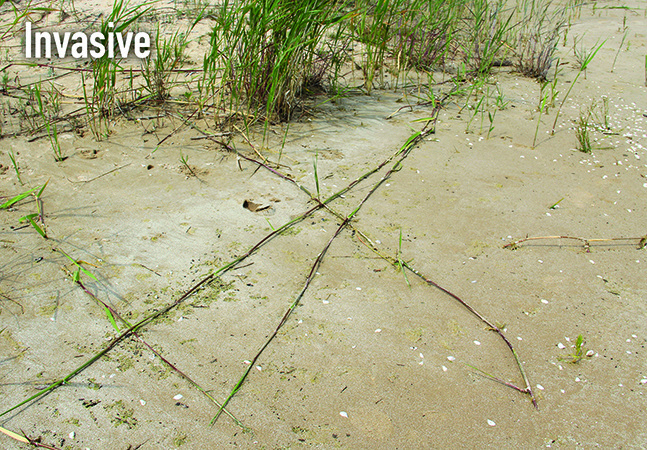 Below ground, introduced Phragmites forms a dense network of roots and rhizomes which can extend downward several feet. It spreads horizontally by sending out rhizome runners which can grow 10 or more feet in a single growing season if conditions are optimal. Along rivers and coastal shorelines, fragments of rhizomes transported from infested sites far away settle in new spots and become rooted. Once a problem stand of Phragmites has been identified, one or more techniques may be applied to control it. Areas with large, established, populations of Phragmites are best restored using herbicides. Other options include prescribed burning, hydrologic controls, and removal. Landowners should follow the recommended control methods that include herbicide treatment followed by removal of the invasive plants and annual maintenance, as outlined in the publication Guide to Control and Management of InvasivePhragmites. At this time no means of biological control are available in the United States for treating Phragmites infestations. Glyphosate-based herbicides (e.g., Rodeo®) are the most effective control method for established populations. Rodeo, a nonselective herbicide, kills all grasses and broad-leaved emergents. It degrades quickly into natural products, so it is virtually non-toxic to aquatic animals. If a population can be controlled soon after it has established chances of success are much higher because the below-ground rhizome network will not be as extensive. Small stands can be treated by injecting stems, hand swiping, or selectively spraying with backpack sprayers. Large stands require more substantial equipment and can include a helicopter. Herbicides are best applied in late summer/early fall after the plant has flowered either as a cut stump treatment or as a foliar spray. It is often necessary to do repeated treatments for several years to prevent any surviving rhizomes from resprouting. When applying herbicides in or around water or wetlands, be sure to use products labeled for that purpose to avoid harm to aquatic organisms. Permits are required from the Michigan Department of Environmental Quality for chemical treatments. For chemical treatment information including permitting requirements and blank permit application forms visit www.michigan.gov/deqinlandlakes (Select Aquatic Nuisance Control) or contact the Aquatic Nuisance Control Program. 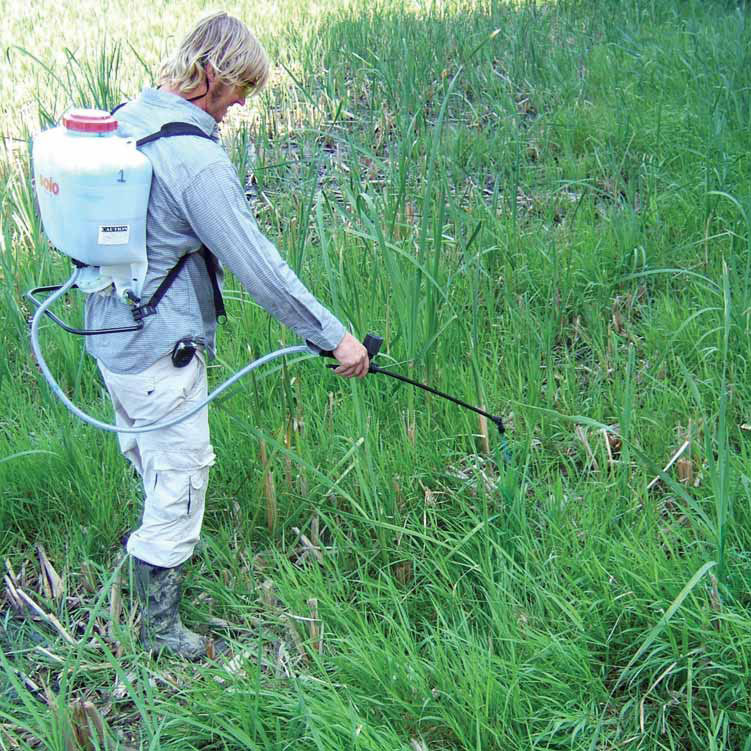 The use of a licensed applicator who is certified in aquatic pest management is recommended for herbicide application, especially in large, dense stands and in sensitive areas such as wetlands: Pesticide Application Businesses Licensed by the State of Michigan. Prescribed burning after the plant has flowered, either alone or in combination with herbicide treatment, may also be effective. Burning after herbicide treatment also reduces standing dead stem and litter biomass which may help to encourage germination of native plants in the following growing season. Plants should not be burned in the spring or summer before flowering as this may stimulate growth. Prescribed burning does not require a permit from the State of Michigan, but often does require approval from the local unit of government. Not successful in eradicating common reed, but is useful to eliminate the fire hazard potential. Cutting any grass at the wrong time may stimulate growth and increase stem density. Cutting at the end of the growing season or in winter can increase density. Removal of Phragmites through digging and hand pulling is also ineffective due to the extensive root system created by this plant. Disturbing the soil through mechanized disking or raking may also contribute to rapid expansion of Phragmites and is not recommended. Mechanical removal of dead plant material can be beneficial in larger stands for better growing conditions for native plants. However, this can also promote the growth of any Phragmites plants that were not affected by herbicide treatment. Flooding can control common reed if rhizome is covered with water for four months during the growing season. It is important to ensure that flooding reaches all affected marsh areas for this period. What To Do With Phragmites Along The Shoreline? 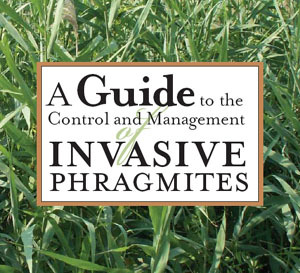 Landowners should follow the recommended control methods that include herbicide treatment followed by removal of the invasive plants and annual maintenance, as outlined in the publication A Guide to the Control and Management of Invasive Phragmites. Mowing is not an effective control method for Phragmites as regeneration from rhizomes often causes an increase inPhragmites stand density, and can spread viable seeds. Mechanical methods must be used carefully to avoid stimulating growth of Phragmites. Mowing alone leaves the rhizomes behind. Regeneration from those rhizomes may cause an increase in stand density. Removal of Phragmites through digging and hand pulling is also ineffective due to the extensive root system created by this plant. Disturbing the soil through mechanized disking or raking may also contribute to rapid expansion of Phragmites and is not recommended. Proper treatment of Phragmites uses a limited and targeted approved herbicide under a DEQ aquatic nuisance permit. Next steps can include removal of dead treated Phragmites stems or prescribed burn of the treated area. Permits are required from the Michigan Department of Environmental Quality for chemical treatments and for removal. For chemical treatment information including permitting requirements and blank permit application forms visitwww.michigan.gov/deqinlandlakes (Select Aquatic Nuisance Control) or contact the Aquatic Nuisance Control Program. The use of a licensed applicator who is certified in aquatic pest management is recommended for herbicide application, especially in large, dense stands and in sensitive areas such as wetlands: Pesticide Application Businesses Licensed by the State of Michigan. (For Great Lakes shoreline, search by Category 5 for wet areas and Category 6, Right-of-Way, for dry areas). REMEMBER - Before taking any action, you should first determine whether the plants are native or invasive Phragmites. 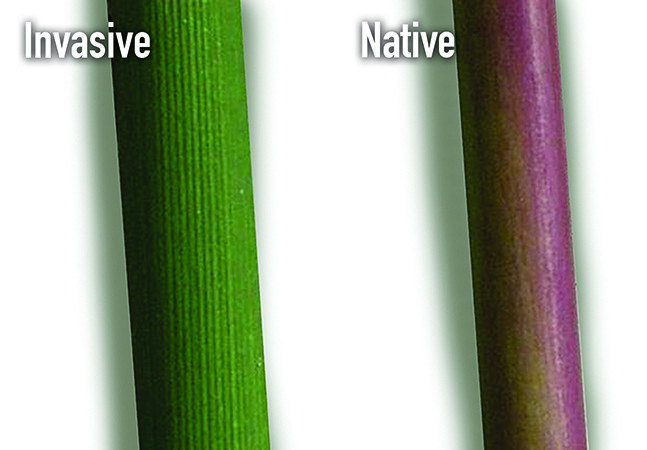 The base of invasive Phragmites (shown here) lacks the reddish/purplish hue that native Phragmites has on its stems. Extremely aggressive, Phragmites can grow through solid surfaces, such as driveways, roads, and sidewalks. Who To Contact For Permit Information? This is video #9 in the "Protecting What You Love" series created by Tip of the Mitt Watershed Council. Phragmites (Phragmites australis), also known as the common reed, is an aggressive wetland invader that grows along the shorelines of water bodies or in water several feet deep. Once introduced Phragmites invades a site it quickly can take over a marsh community, crowding out native plants, changing marsh hydrology, altering wildlife habitat, and increasing fire potential. 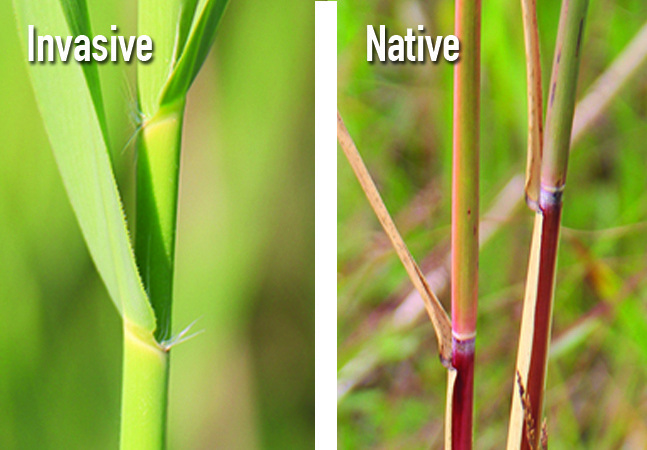 This video will help you distinguish between native and non-native or invasive Phragmites. Early detection can help prevent the rapid spread of the aggressive invasive species.